Greenberg R. Chronic Lyme Disease: An Unresolved Controversy. Am J Med. 2017;130(9):e423. Shapiro ED, Baker PJ, Wormser GP. False and Misleading Information about Lyme Disease. Am J Med. 2017. 3 Replies to "Chronic Lyme disease: Doctors seek answers"
The AJM article cites an American Lyme Disease Foundation paper (authored by Philip Baker), that was published in response to the award-winning Pei-sze Cheng I-Team investigative report on Julia. At the time the segment was airing, Dr. Baker sent copies of the ADLF paper (without permission) to her father’s personal email list of friends and family members. 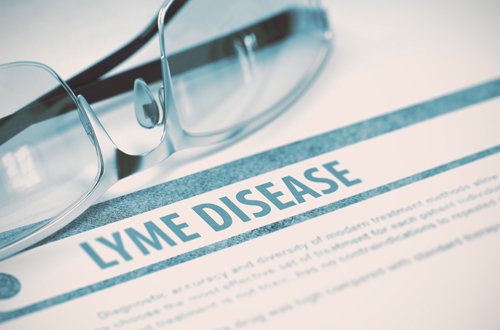 Both Dr. Gary Wormser and the American Lyme Disease Foundation paper made public claims that, Since Julia’s two-tier tests were negative, it is extremely unlikely that she could even have Lyme disease. Since that time, her family discovered that positive ELISA results were hidden from them by one of the hospitals that she was admitted to. After progressing in her treatment, Julia currently tests positive for Borrelia burgdorferi as well as four additional coinfections including Borrelia Miyamotoi, Tularemia, Bartonella, and Babesia. In spite of all of the documentation of infection with multiple tick-borne illnesses and demonstrated clear progress in her symptoms, Julia continues to receive insurance denials for her treatment. Extremely suspiciously, the most recent denial from the New York State, lifted phrases word for word from the ADLF paper. New York State has refused to reveal the name of her reviewer. I hope the family requests that New York States Attorney General Eric Schneiderman investigate many irregularities in Julia’s insurance denials. Equally unethically, representatives from the CDC have also attempted to interfere in Julia’s care. The attempted interference in the medical care of a young girl who is clearly fighting for her life by the authors of the AJM opinion piece and the CDC just gives more evidence that they are being blinded by their own dogma and will strike out at anyone who challenges them. Thank you Dr. Cameron for sharing the letter that I wrote to the editor of the American Journal of Medicine regarding a poorly written biased article. I am grateful that my letter was published. The response of the authors is quite telling. addressed at length in a commentary by Melia and Auwaerter. A phrase I heard recently comes to mind: “You are entitled to your own opinion, but not your own facts. Patients like myself are getting fed up with what seem like semantic arguments: it is active Borreliosis, or is it something else. It’s obvious that something is going on; there is a medical condition that needs treating. By closing off the argument, Shapiro et al. are doing patients a great disservice. They show a remarkable lack of scientific curiosity in why such a large proportion of people with obvious tick bites and EM rashes either fail the 2-tier test or have lingering life-changing symptoms. A large chunk of patients are respond to antibiotics, but given the current scientific uncertainties, treatment should be based on clinical response. If we can give antibiotics for mild acne, why not give antibiotics to enable people like me to be able to work and live a normal life?